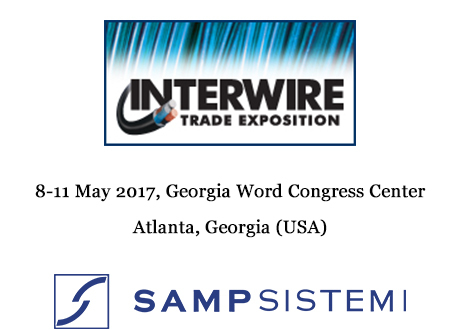 Sampsistemi and its American subsidiary SAMP USA will exhibit several machines representing the company’s ever-growing product range. Indeed, following the recent acquisitions of two reputable Italian companies, Euroalpha and Euro Extrusion, Sampsistemi has broadened its overall technical know-how and service capabilities, and intends to further strengthen the capability to market and service Euroalpha, Euroalpha RM and Sapsistemi Extrusion products on a global basis, given the distinguishing, unique values of each product line and brand. The R1 Rod Breakdown Machine by Euroalpha, an innovative and compact rod breakdown machine to cope with space shortage often present in drawing plants: 4 mt long only. Capstans are arranged onto two superimposed rows, and they are all individually motor-driven to perform limited-slip drawing. The machine features submerged lubrication on the lower row of capstans and exclusive spray lubrication on the upper row. Thanks to its innovative design, the R1 provides performance and wire quality that are absolutely comparable with the ones of conventional rod breakdown machines, with capstans arranged onto a single straight-line and submerged into the drawing lubricant, but against lower operational costs. The R1 does represent the most cost-effective solution to draw copper rod, as for capital investment and operational expenses. The machine can be combined with either AH horizontal or RC vertical annealers, as well as with any model of take up belonging to the Sampsistemi and Euroalpha complete and flexible system. It can also be supplied without annealer for hard wire drawing. EDT 1250 Double-Twist Strander by Euroalpha, a multi-purpose stranding machine suitable to produce semi-rigid strands with heavy compacting up to 19 wires, flexible strands as well as insulated cables lay-up. The EDT 1250 represents a high-productivity and price-effective alternative to rigid cage stranders for a wide range of applications. The machine features an innovative mechanical architecture to achieve solidity, easy access to the various parts, minimal floor space (space occupation) and easy installation (no pit required). In addition, its single-bow design reduces energy consumptions. Special twisting pulleys are available for the production of high-quality flexible strands and insulated cores laid-up. The precision traverse by ball-nut screw mechanism is driven by brushless motor with inverter control. The clamping of take-up reels is perfectly balanced thanks to the dual moving pintle system. The SAMP 60-25 Extruder, designed to maximize productivity while at the same time ensuring maximum flexibility and stability in terms of manufacturing process. The high capacity and productivity has been reached by means of the new screw/cylinder profile. The compound thermic stability can be monitored and controlled at any time by anticipating the thermic flow during thermoregulation. The extruder features an improved Sampsistemi software for the automatic calculation and monitoring of the screw rpm during the start-up, setting-up and acceleration/deceleration ramps. The ES.60.15D Extruder, designed for silicone rubber shows the Sampsistemi knowledge in the rubber extrusion market for wire, tube and tires business. The high production quality is obtained by means of liquid thermoregulation with an accurate temperature control during every phase of the extrusion process. The compound thermic stability can be monitored and controlled at any time by a user-friendly HMI with large display, whereas the production program is managed by means of customized receipts with production trends and graphics. SAMP USA is equipped to manage machinery upgrades and complete rebuilds via their knowledgeable service and spare parts department. Thus enabling the end user to maximize production potential and minimize cost. A comprehensive display of the Sampsistemi product line and the company’s after–sales service and spare parts group function will be available during the show.